The one thing I really like and at this point, expect from IKMultimedia products is something powerful wrapped in something portable. While the new iRig Pro Duo mobile audio interface definitely does not disappoint, it’s the versatility in what it can do and the quality in sound you get in such a small interface that really are the stars here. The unit features two XLR/TRS combo audio input jacks with gain controls and phantom power, ultra-low noise/high-headroom preamps, high-end 24-bit AD/DA converters, MIDI IN/OUT jacks for connecting controllers and other MIDI devices, a stereo pair of TRS balanced output jacks and a headphone out with level control. One of the smartest options it offers here is the ability to power up via 2 AA batteries while also coming with an array of additional powering options for virtually all of your mobile devices. After trying it out with GarageBand using my iPad, I found the sound quality to be top notch. Recording guitar was easy and the gain knobs allow for precise volume control, something that is such a valuable feature in a portable audio interface. It’s a huge step up from the iRig HD, which is also great but after using the Pro Duo, you can see that it’s a bit limiting in that respect. An interesting plus is that it’s shaped like a portable vintage handheld radio, which I find to be a nice design. For portable recording, the iRig Pro Duo is hard to beat as it’s a great pull-out-and-play interface ready to connect to your mobile device or tablet and record anywhere. Priced at $199.99 retail, it also comes with over $450 worth of useful apps and software from IKMultimedia that allow it to work right out of the box. These include powerful tools like AmpliTube® Metal, SampleTank® SE and T-RackS® Classic for Mac and PC as well as a full complement of recording and processing apps for iPhone, iPad, iPod touch and Android devices. As for compatibility, the iRig Pro DUO also works with a wide variety of third party apps and software, like Cubasis, ProStudio Vocal FX, MultiTrack DAW, Samsung Soundcamp and more. It’s also compatible with Apple’s GarageBand and Logic Pro X apps, and iOS Voice Memos and more. With two inputs, multi-track recording anywhere makes the iRig Pro Duo one of the smallest dual channel interfaces on the market while allowing you to connect almost any instrument including high-end phantom powered condenser microphones. It has a 48V phantom power switch. It also has zero latency via either its 2 balanced TRS outputs or its headphone out jack with onboard level control. 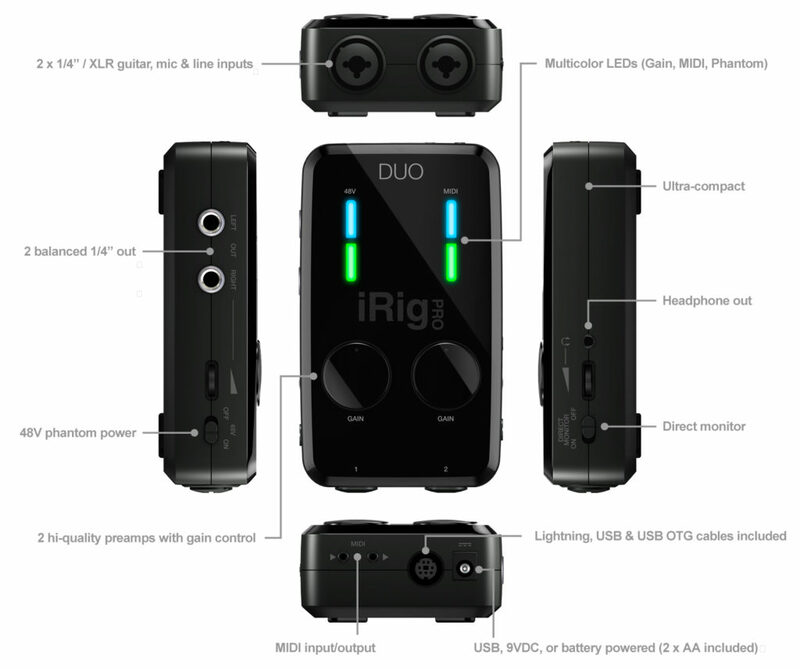 Overall, the iRig Pro Duo is a robust little interface bursting with features, great for on-the-go recording.